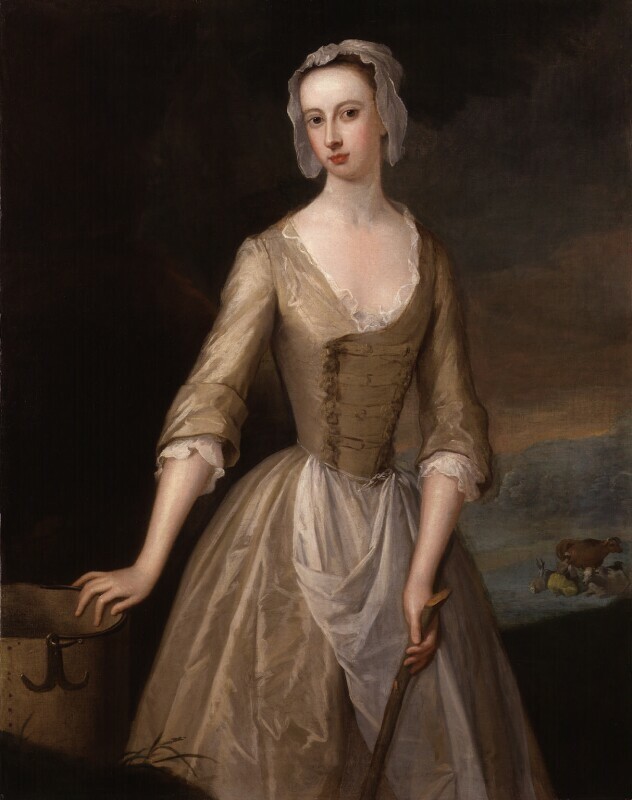 Catherine Douglas (née Hyde), Duchess of Queensberry (1701-1777), Eccentric beauty and patron of writers. Sitter in 4 portraits. Painted at a time when Arcadian themes were fashionable, the Duchess is shown enjoying a rustic idyll. Her hand rests on a milk pail while a real milkmaid is shown milking cows in the background. More detailed information on this portrait is available in a National Portrait Gallery collection catalogue, John Kerslake's Early Georgian Portraits (1977, out of print). Notorious 'Thief Taker General' Jonathan Wild is hanged at Tyburn. He ran one of the most successful gangs of thieves of the era, while appearing to be the nation's leading policeman. Pardoned Jacobite leader Henry St John, 1st Viscount Bolingbroke forms an opposition to the Prime Minister Robert Walpole. Order of the Bath is founded by King George I. Poet Alexander Pope produces a new edition of Shakespeare, which he rewrites and edits in numerous places. Philosopher Francis Hutcheson publishes his first major work An Inquiry into the Original of our Ideas of Beauty and Virtue, published in two treatises concerning aesthetics and morality. Russian tsar Peter the Great dies. Treaty of Hanover between England, France and Prussia. Composer Antonio Vivaldi debuts the set of violin concertos known as The Four Seasons. Composer Johann Sebastian Bach debuts his Easter Oratorio in Leipzig.